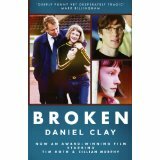 Congratulations to Anne Coates and Janira Santiago, the two winners of autographed copies of Daniel Clay's acclaimed Broken Thanks to everyone who entered! And thanks to Daniel for sharing his riveting book, for being so generous with his time and energy and taking part in my Q&A, and for gifting these two lucky winners with his novel. The winners will also be notified by email. Wait! How did I miss a giveaway? That's what I get for going on vacation for a week. But I'm sure your Florida vacay made up for whatever you've missed in the good ol' blogosphere.